김은준 교수 실험실의 정우석 KAIST 의과학대학원 연구원, 최수연 KAIST 생명과학과 박사과정생, 이은이 IBS 시냅스 뇌질환 연구단 연구원, 박하람 KAIST 생명과학과 박사과정생 논문이 Nature Neuroscience 에 게재되었습니다. Chung W, Choi SY, Lee E, Park H, Kang J, Park H, Choi Y, Lee D, Park SG, Kim R, Cho YS, Choi J, Kim MH, Lee JW, Lee S, Rhim I, Jung MH, Kim D, Bae YC, and Kim E. (2015). Social deficits in IRSp53 mutant mice improved by NMDAR and mGluR5 suppression. 자폐성 범주 장애의 사회성 부족 원인 찾았다. KAIST 김은준 교수 "자폐 원인규명·치료법 개발 기여 기대"
(서울=연합뉴스) 이주영 기자 = 국내 연구진이 자폐증 범주 질환의 대표적 증상 중 하나인 사회성 부족이 발생하는 과정을 생쥐 실험을 통해 밝혀냈다. 기초과학연구원(IBS) 시냅스뇌질환연구단(단장 김은준 KAIST 교수)은 26일 국제학술지 '네이처 뉴로사이언스'(Nature Neuroscience)를 통해 자폐증 범주 질환에서 나타나는 유전자(IRSp53) 변이를 생쥐에서 발현시키는 실험을 통해 사회성 부족 증상이 발생하는 과정을 규명했다고 밝혔다. 자폐증 관련 유전자(IRSp53)가 없는 생쥐의 사회성 실험. a(사진 왼쪽) : 정상 생쥐(WT)는 낯선 생쥐, 물체와 같은 공간에 있으면 물체보다 낯선 생쥐에 더 많은 관심을 보인다(빨간색 쪽으로 갈수록 머문 시간이 긴 것이다.) b(사진 오른쪽) : IRSp53가 없는 생쥐(KO)는 사회성이 결여돼 낯선 생쥐에 관심이 없으나 NMDA 수용체의 기능을 억제하는 약물들(Memantine, MPEP)을 투여하면 사회성이 정상 수준으로 개선돼 낯선 생쥐를 탐색한다. 약물 대신 식염수(saline)를 투여한 쥐는 사회성이 전혀 개선되지 않았다. IRSp53 유전자의 변이는 자폐증, 정신분열증, 주의력결핍과잉행동장애(ADHD) 등에서 발견되지만 사회성 부족 증상과의 구체적인 연관성 등은 밝혀지지 않았다. 연구진은 유전자 조작으로 IRSp53이 없는 생쥐를 만들어 낯선 생쥐, 사물과 함께 한 공간에 두고 행동을 관찰했다. 그 결과 IRSp53 유전자가 없는 생쥐는 낮선 생쥐보다 사물에 더 큰 관심을 보이는 등 전형적인 사회성 부족 증상을 보였다. 또 IRSp53 유전자가 없는 생쥐의 뇌에서는 자폐증과 정신분열증 등 신경질환과 관련이 있는 것으로 알려진 'NMDA' 수용체가 과다 발현돼 있는 것으로 확인됐다. 이어 이 생쥐에 NMDA 수용체를 기능을 약화시키는 약물(Memantine, MPEP)을 투여한 뒤 같은 실험을 한 결과, 낯선 생쥐에 관심을 보이며 접근하는 등 사회성 행동이 정상 수준을 회복됐다. 김은준 교수는 이전 연구에서는 NMDA 수용체 기능이 부족할 때 사회성이 결여된다는 것을 확인했으나 이 연구는 NMDA 수용체 기능이 증가할 때도 사회성이 결여될 수 있음을 보여준다며 이는 NMDA 수용체 기능이 정상 범위에서 벗어나면 사회성 부족이 유발될 수 있음을 뜻한다고 설명했다. 그는 또 "사회성 부족은 자폐 외에 정신분열증이나 ADHD 같은 다른 정신질환과도 관련이 있는 만큼 이 결과는 다양한 정신질환의 발병원인 이해에 도움을 줄 것"이라며 "이를 관련 질환 치료전략에 활용하고 이 연구에 사용된 동물모델도 약물 개발 등에 활용할 수 있을 것"이라고 말했다. The research paper by Professor Eun Joon Kim’s laboratory, Woo Suk Jung of KAIST Graduate School of Medical Science and Engineering, Soo Yeon Choi, Ph.D of KAIST Biological Sciences, Eunyi Lee of IBS Synapse Brain Dysfunctions Center, and Haram Park, Ph.D of KAIST Biological Sciences, was published in Nature Neuroscience. IBS Synapse Brain Dysfunction Center, a research team led by Professor Eun Joon Kim of KAIST, discovered the mechanism by which social deficit, one of the main symptoms of autism spectrum disorders, occurs, by using IRSp53 mutant mice. This research was published in the international academic journal Nature Neuroscience. IRSp53 mutations are discovered in autism, schizophrenia, ADHD, etc., although its exact correlation with social deficit symptoms has not been discovered. IRSp53 mutant mice display NMDA receptor, which is indeed related to brain dysfunctions such as autism and schizophrenia. Above is the result of a social deficit experiment in IRSp53 mutant mice. IRSp53 mutant mice showed less interest in a stranger mouse relative to an inanimate object (B) compared to wild-type mice (A) when put in the same cage. 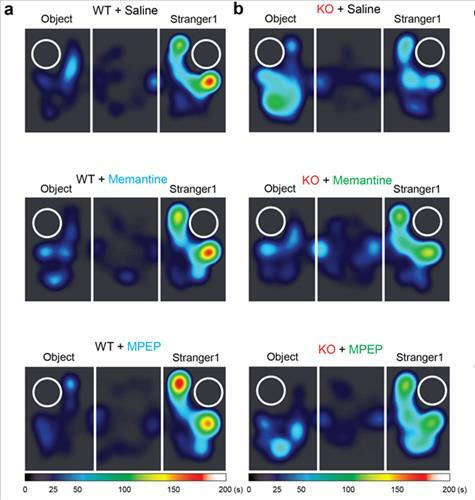 However, when treated with memantine, an NMDAR antagonist, the social interaction in these mutant mice were normalized. Mutant mice treated with saline instead of memantine showed no improvement in social interaction. 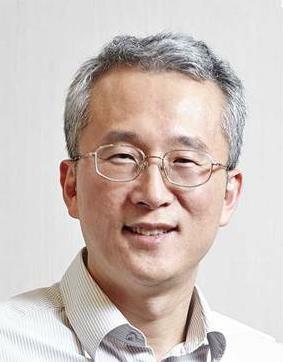 Professor Eun Joon Kim commented that while previous researches suggested that social deficits can result from reduction of NMDA receptor activity, this research additionally demonstrate that improvement in NMDA receptor function can also result in social deficits, which implies that abnormal levels of NMDA receptor function lead to social deficits. He added that “since social deficits are related to brain dysfunctions other than autism, such as schizophrenia and ADHD, this research may help understand the cause for various mental illnesses and develop cures for such diseases.